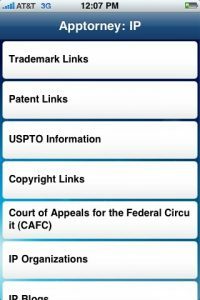 Now intellectual property lawyers can search and file patents and trademarks, research IP law, and follow IP blogs, all from their iPhone. The new app, Apptorney: IP, released this week, is designed to provide easy access to a range of Internet resources commonly used by IP lawyers. The app collects and organizes links to make it easy to access key resources and features. By way of example, the trademark section includes links to the USPTO’s trademark pages, trademark-search tools, the Trademark Trial and Appeal Board, trademark statutes, and international trademark sites. It doesn’t simply link to the USPTO site, but to specific sections and content within the site. While the app includes U.S. patent, trademark and copyright statutes, it has them in PDF, which makes them clumsy to use on an iPhone. The app also links to Web versions of the statutes. Other sections of the app provide links to the Court of Appeals for the Federal Circuit, IP organizations and IP blogs. The app was developed by IP lawyer and blogger Erik M. Pelton.